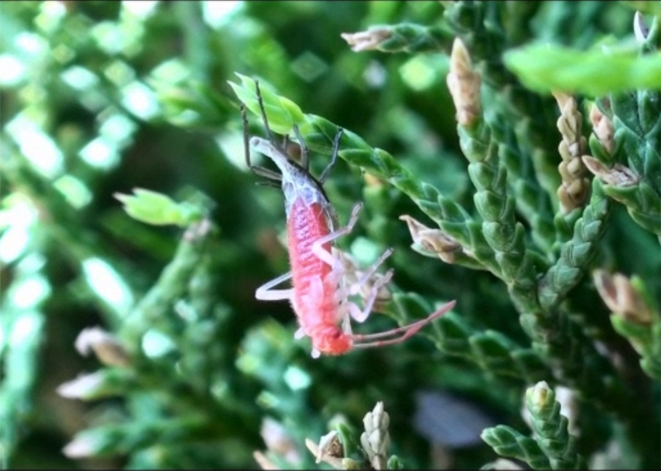 This Jadera haematoloma nymph is in the process of molting-- shedding its old "skin" to proceed to a new life stage. Soapberry bugs pass through five life stages, known as instars, before they reach adulthood. The amount of time a bug spends in each instar is variable and can last anywhere from one week to nearly a month, depending on the temperature of its environment. The final molt from the fifth instar into adulthood grants the newly mature soapberry bug a pair of wings and functional reproductive organs.